We, the people, can build a better India, says Ashutosh Gowarikerâs new movie. DEC 26, 2004 – FEW RECENT DIRECTORS have delivered more go-for-broke filmmaking than Ashutosh Gowariker did in Lagaan, particularly when Aamir Khan, armed with a crude bat, tries to convince fellow villagers that cricket is childâs play. As they watch, he misses the ball, he misses again… and when he finally connects, it isnât just a six, itâs a six that strikes the bell at a temple on a nearby hillock, thereby vindicating Aamirâs stand â why, the gods themselves have spoken! Iâd have laughed at this corniness, had only my jaw not dropped that someone had actually made such a madly audacious sequence work. If Lagaan crackled with a 220V charge, Gowarikerâs latest, Swades, hums along sedately on a couple of AA batteries â an appropriate analogy, if you think about it, considering it deals with the generation of power in a blackout-prone village, Charanpur. The instant-classic status that befell Lagaan has prompted Gowariker to aim higher â and we know this straightaway because he begins with a quote from Mahatma Gandhi. Then â after some wobbly set-up sequences in America, including an embarrassingly pat this-happened-then-this-happened recitation of the heroâs life-story â successful NRI Mohan Bhargava (Shah Rukh Khan) sets off to Charanpur for personal reasons, and soon after he lands in India, thereâs a fabulous bit of whimsy. Heâs lost at a road that forks into two, when a sadhu (scene-stealer Makarand Deshpande) appears, proclaiming, âTum raasta bhatak gaye ho,â? and leads Mohan to his destination. Thatâs the kind of film Gowariker is attempting, something like the last third of Guide â a man goes to a village for largely self-serving purposes, then faces a crisis of conscience about the value of selflessness. The road to Charanpur isnât just a geographical quest â itâs a spiritual search, making Mohan reexamine his life in an adopted land of plenty when his own people lack everything he takes for granted. And itâs in weaving these messages into a mainstream movie that Swades makes its biggest missteps. One minute, youâre sobered by the story of a poverty-stricken farmer. The next, youâre giggling at Mohanâs amusing attempts to wear a dhoti. Immediately after, thereâs a speech that mocks our slavish adherence to sanskar and parampara. And I began to wonder, is this film trying to entertain me or ennoble me? Gowariker would argue heâs doing both, but this sort of thing is tricky in a big, commercial movie, especially one thatâs a bit too issue-happy. Swades addresses not just power generation, but also untouchability, child marriage, illiteracy, poverty â all of which add to groaning screen minutes in an already overlong film. The overload of nobility doesnât help either â when, say, the inspirational story behind the village school is narrated, AR Rahman fills the background with hymnal chants; weâre all but asked to genuflect. This occasional tendency to lay it on thick backfires big-time towards the end. The local schoolmaster isnât just old and revered, heâs also (wouldnât you know?) a freedom fighter â so when this noble soul looks lovingly into Mohanâs eyes and anoints him successor, anyone whoâs seen half a Hindi movie can guess whether Mohan will choose America or Charanpur. So the concluding portions â detailing his choice â appear interminable, salvaged only by the raw longing in Rahmanâs voice in the goosefleshy yeh jo des song, picturised such that even our poverty seems more alive and worth coming back to than all of Americaâs riches. Everything is meticulously staged, tastefully mounted, and a delightful undercurrent of humour animates a bunch of pitch-perfect performances. (Shah Rukh, in shirts and jeans far removed from his usual Manish Malhotra fussiness, admirably portrays decent middle-classness.) And there are bursts of sheer magic â when an elderâs wrinkled-parchment face is lit for the first time by electricity, when Mohan finally drinks non-bottled water from a kulhad, when Gita (Gayatri Joshi; no mere heroâs-arm-candy, but an idealistic schoolteacher unafraid to hold forth on swabhiman and atma-nirbharta) absentmindedly writes lyrics from her love solo on the blackboard during class, and, best of all, in the yeh tara number, with its infectious ichak-dana singsong. The latter is staged during a touring-talkies screening of Yaadon Ki Baaraat â and thatâs no coincidence. This lets Gowariker to briefly feature lucky mascot Aamir (cute as a button in the title song, bow tie and all), while reminding us that Swades itself is a yaadon ki baaraat â harking back to a time when mother figures resembled not Hema or Rati but Leela Misra (with lined faces and loving hearts, like the adorable Kishori Ballal here), when heroines like Nutan hinted at what was in their heads rather than on their chests (Gayatri Joshi even looks Nutan-like, lanky and all right angles), and when cinema was as much about success as a subjectâs worthiness. Swades may finally be something you stand back and admire rather than fall into and fully embrace, but how often do you say that about a movie? JAN 2, 2005 – RITUPARNO GHOSH’S RAINCOATappears to tell a story that could be detailed on the back of a bus ticket. Mannu (Ajay Devgan) comes to Kolkata, meets ex-girlfriend-and-now-married Neeru (Aishwarya Rai), and talks to her until the film ends (with a heartbreaking twist characteristic of O. Henry, credited here as an inspiration). Walking out, you may well grumble, âWhy, this sort of thing used to be done in one half-hour episode of Shyam Benegalâs teleserial Katha Sagar, that dramatisation of short stories from writers worldwide. Why did it need to be two hours long?â? But Raincoat is only deceptively simple â scratch its surface, and you could spend days wondering what things really mean. Is Neeruâs off-key rendition of meri jaan mujhe jaan na kaho (from Anubhav, which dealt with a troubled marriage) meant to hint that her own marriage is in trouble? Or, is it simply an in-joke, Aishwarya Raiâs revenge for Ajay Devganâs off-key rendition of chingari koi bhadke in their earlier collaboration Hum Dil De Chuke Sanam? When we see a can of shave foam in the bathroom of the well-to-do friend Mannuâs staying with, and when Mannu dabs his face with shaving cream from his own much-squeezed tube, does this merely suggest the economic disparity between the two? Or, does this actually reveal Mannuâs self-reliance, thus showing us how difficult it must be for him to do what heâs going to do, beg friends for money to set up a business? A friendâs wife teaches Mannu how to use a mobile phone, and later gives him a sleeping pill knowing heâll need it. Neeru (in a flashback) orders a hesitant Mannu to take her to an adult movie, and elsewhere, when a bedridden Mannu playfully pulls her towards him after his mother leaves the room, she doesnât squeal, âChhodo na, maa dekh legi,â? as youâd expect, but instead explains rather practically, âMujhe bhi bukhaar lag jaayegi.â? Are these just things that the characters do, or are they indicators that women are generally stronger than men? When Mannu sets forth to Kolkata in a train, Mathura nagarpati kahe tum Gokul jaay plays in the background. Is this simply one of Debojyoti Mishraâs haunting compositions, or do the lyrics ask us to view Mannu-Neeru in the Krishna-Radha mould? Despite Aveek Mukherjeeâs exquisite cinematography â thereâs a breathtaking shot of a rainy street viewed from the inside of a rickshaw, through a rainbow-striped plastic sheet keeping out the water â why does the production feel stagy? Is this deliberate, because the filmâs structure is like a play, where in Act 1, Mannu/Neeru tell each other things, and in Act 2, they discover things about each other? And so on… so Raincoat definitely isnât casual entertainment, but if youâre willing to see, hear, feel, itâs an intensely rewarding experience â if only for the performances. Annu Kapoor pitches in a characteristically energetic cameo, Ajay Devgan is superb as a sad-sack loser (a world-and-a-half apart from the cool-cat villain he played earlier this year in Khakee â howâs that for range!) â but the movie really belongs to Aishwarya Rai. For the first time in a while â or is that the first time ever? â she convinces us that sheâs been touched by life, tainted by it, looking all the more ravishing because she looks… real. That, more than anything in this wonderful film, could well be Rituparno Ghoshâs greatest achievement. Now how about a review of lagaan itself. I agree that there’s much more to it than the simple narrative..although not sure about the Ash singing (and relation to Hum Dil De..)…can’t imagine Ghosh doing that. Oh..also..it’s her first convincing act since Hum Dil..or at least that is what I immediately felt after watching this. Well i liked Swades a lot. Ok the movie is too long, sounds preechy (can we say that ?) etc… but there is something so innocent, so… cute in it ! And the last song is superb. Lagaan deals with indian difficulties. 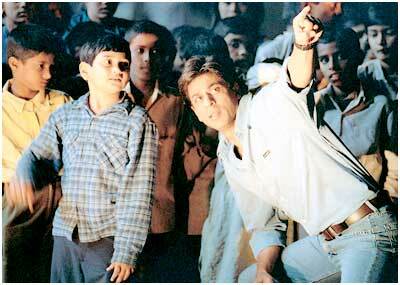 What i like in swades, as a “non-desi”, is that it talks to all strangers all over the world. Very irrational feeling that makes me say crazy stuff like : “Sometimes, i prefer swades over lagaan”. Please don’t jump at me, or give me some cinema classes… just a matter of heart. Why are your archived reviews coming up as current posts – when I click on the following link for ‘Blogical Conclusion’ ? I have been waiting for reviews of Dil, Dosti and Johnny Gaddaar, intead I am being treated to reviews of Ek Hasina thi and raincoat ? “One minute, you’re sobered by the story of a poverty-stricken farmer. The next, you’re giggling at Mohan’s amusing attempts to wear a dhoti. Immediately after, there’s a speech that mocks our slavish adherence to sanskar and parampara. And I began to wonder, is this film trying to entertain me or ennoble me? I didnt find the above to be an issue at all. SRK is returning back to his roots after a long time and his initial attempts to adjust have been told with a slight comic touch. It is not like as if there was a separate comedy track that ran parallel with the main serious storyline. And stuff like facing difficulty trying to wear a dhoti and such are the kind of small but practical/realistic things that some NRIs are bound to encounter. It is very much in line with the film. Being someone who has lived abroad for quite a while I was able to identify much more with SRK’s character and the movie. Maybe it might not appeal to the local audience as much(I am not including you, as I know you have been in foreign soil for some time), but compare with this with the medicore NRI-comes-to-India-falls-for-a-local-girl kind of movies that mainstream Bollywood has churned out before-some even with SRK in it, with pretentious patriotism thrown in for good measure. Swades was a breath of fresh air. I’m so glad AG bound SRK and made him act the way he wanted him to…no hamming…no over-the-top sequences. IMHO, this is one of SRK’s best films. Even Mani didn’t quite manage that in Dil Se. Rahman also did a terrific job with the score. oops/turrtle: Not remembrance… just an attempt to get all the reviews in one place. Vijay: Overall impression is simply that I loved parts of it, liked some others, and didn’t care much for the rest. I wish AG had just taken one issue and run with it. But as Shankar says, SRK was terrific, and he made the film worthwhile. Movie closest to my heart in recent times …SRK was superb and ARR’s music was soulful but most importantly it was Ashutosh’s clean and clear intent that made it stand out for me. Except for the Dasshera scene nothing was overdone…..also the scene when gayathri joshi hands over the box to SRK with all Indianess, had me melting…..ending was over simplified with no drama and my guess is more drama would have spoilt all the good work done earlier. bnaray: IMO, even the Dasshera scene wasn’t really overdone. Just a dance-drama. OverLONG maybe. Swades even though melodramatic, is I think a film that is much needed in this time and age. I especially identified with it; I am studying in USA and I so want to go back… The film portrays exactly how I feel. There are millions of things to make India better and schools, villages is the place to start. Sure, there’s the freedom fighter, but I think we need that to induce a bit of sentiment as is normal with our movies; Besides, I myself know a few freedom fighters who taught at local schools. I know, you did not write it off totally, but wish you agreed with the theme of NRI coming back to help motherland more. Of all the vices a director can possess, the most egregious of all is pretension. Raincoat elucidates how a film’s beauty cant be reduced to its parts. The emergence of beauty in a film lies solely in the heart of the director – he can break it, inspite of having every ingredient perfectly in place. In children of heaven you can see & feel that Majidi is in love. Here RG pretends to be in love. Now that is the most disgusting thing you can witness if you manage to see through his elaborate facade.